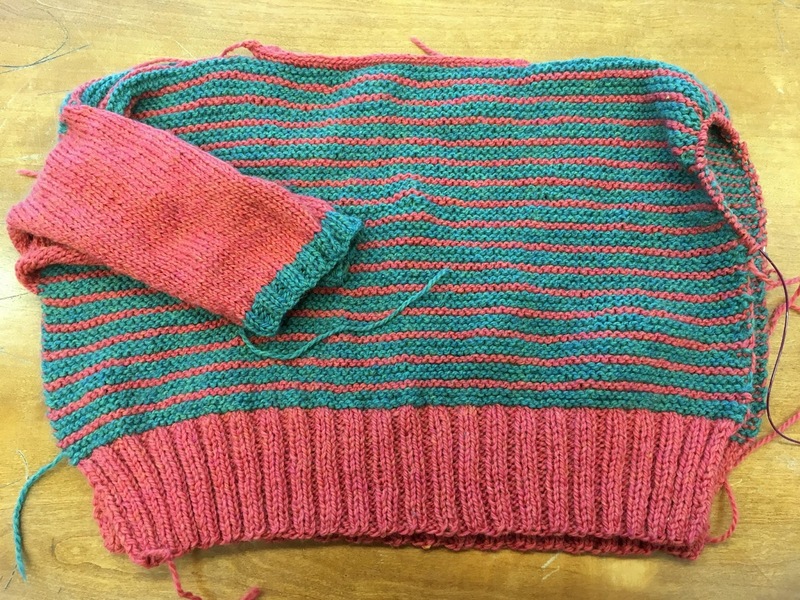 Today is the last day of the Easy A-long, and I managed to get my sweater finished on time! It's currently blocking and I'm hoping to get good pictures taken of it this weekend. Since that sweater is off the needles, I'm focusing most of my attention on this long-languishing Audrey in Unst sweater. I started this back in January 2016 and after getting most of the lower body done, I pretty much ignored it. I picked it up earlier this month because I wanted something smaller than my Easy A to work on during the play, and between that and working on it all day on Saturday, I have everything done except the sleeves. 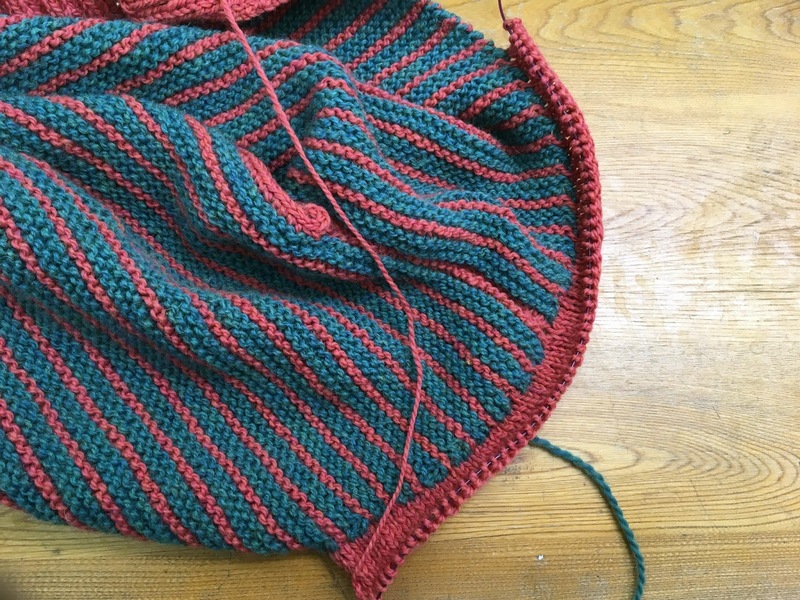 I don't love leaving projects sitting around like that for long periods (despite the fact that I do it ALL THE TIME), but there's something nice about having most of a sweater done after only a couple weeks. 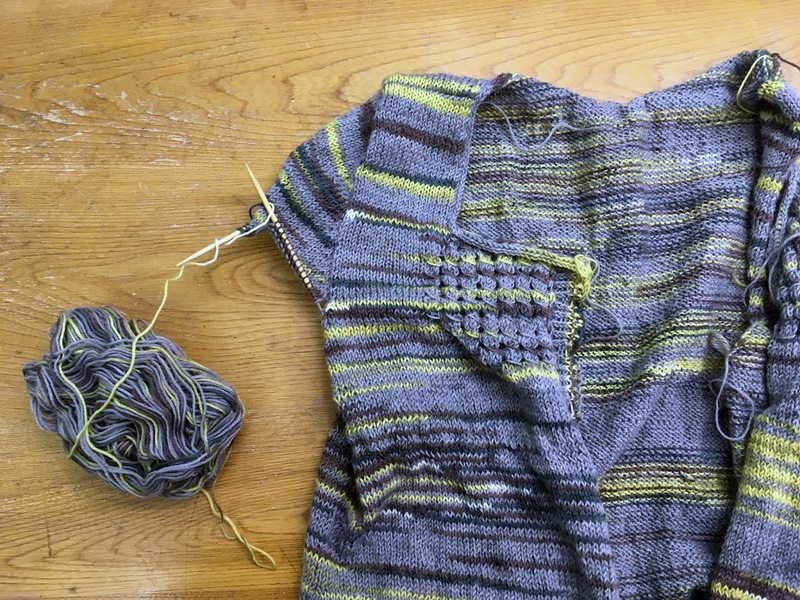 I'm not super stoked to be on sleeve island, but I'm really looking forward to this sweater and I know it will get a lot of wear! Today is the last day to get all my patterns and collections for 25% off with code "Mystic" to help offset my dog's vet bills from earlier this month! Many thanks to everyone who's helped out! 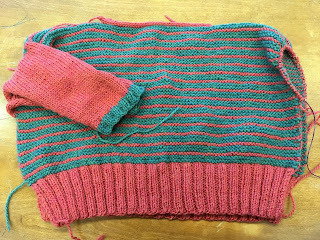 Well, I didn't finish this sweater. 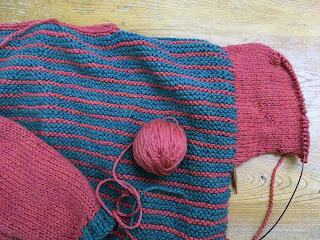 I've still got about half a sleeve - which is really only another hour or two of knitting - and the side seams to go. Saturday was a show choir day, and since I haven't seen any of the area groups perform yet, I was really glad I spent the day at the high school watching them. There's a bunch of great programs this season, although I am especially partial to my brother's group. Yesterday afternoon we went to see Black Panther, and it was one of the greatest movie experiences of my life. I enjoyed every second of it, and while I was hesitant to leave the house again after being gone all day Saturday, I'm really glad I got to see it in theaters. There's just a couple more days left in the Easy A-long in my Ravelry Group! Sweaters have to be finished by 11:59pm on Wednesday, but I'll give everyone through the weekend to post in the FO thread. And a reminder that all my patterns and collections are 25% off with code "Mystic" through February 28th to help offset my dog's vet bills from earlier this month! As evidenced by the barest start of a sleeve up there, I haven't had much time for knitting the past couple days. A big chunk of Wednesday evening was spent sweeping and vacuuming the kitchen after an unfortunate incident involving a glass bowl and gravity, and last night I agreed to go to the town's photography group meeting to be their model for some portrait lighting practice. So. Not a whole lot of knitting going on. This weekend we're supposed to get quite a bit of snow and ice. Tomorrow is supposed to be a big show choir day at the high school, so we'll see how the weather affects that. Otherwise, my plans involve catching up on figure skating and finishing this sweater! All my patterns and collections are 25% off with code "Mystic" through February 28th to help offset my dog's vet bills! I'm back! 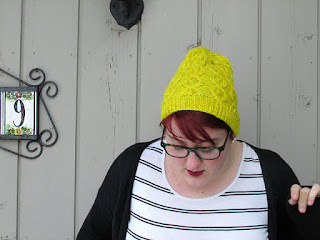 I wasn't planning on being absent from the blog, but I got so busy with the play that I decided I needed to stop worrying about some things for the weekend. The play went so well, I am so pleased with the show we put on, and I am so proud to have been a part of such a great cast and production. As much as I love doing theater, I'm glad to have a bit of a break before the summer musical starts. 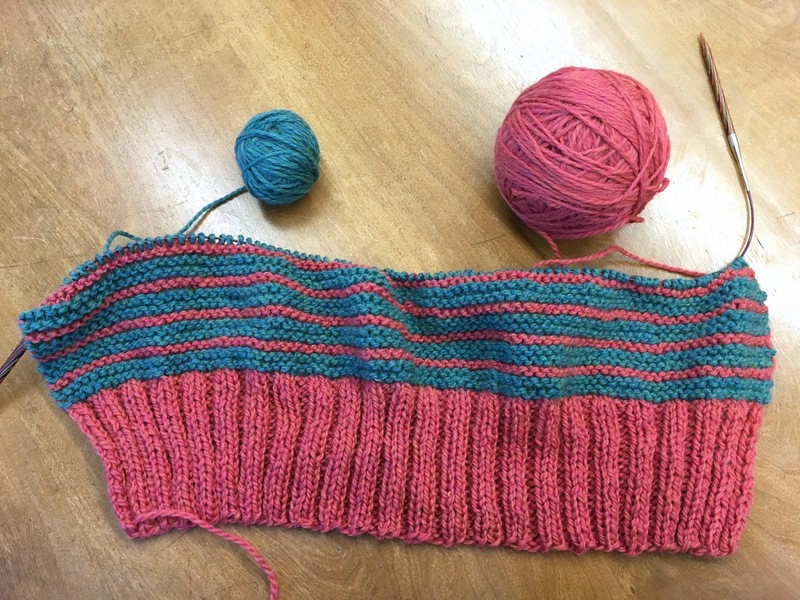 In between naps and rehearsals and performances, I managed to finish the back to my Easy A, get the shoulders seamed, applied the i-cord collar, and knit all of the first sleeve. With a whole week left in the Easy A-long, I'm right on schedule. Thank you all for your good wishes and thoughts for Mystic! The little guy is back home and seems to be recovering well- he's demanding lots of snuggles and belly rubs, and thinks we're not feeding him enough, and sleeping a lot. The sale to help with his vet bills is still going on- 25% off with code "Mystic," and many, many thanks to everyone who's helped out already. It's production week for the play I'm in, which means all the craziness of the last few weeks is going to be magnified. Tonight we're doing Q2Q, which basically means going from each tech cue to the next to make sure all our lights and sound effects will happen in the right place. Then we have three dress rehearsals, and the show over the weekend. 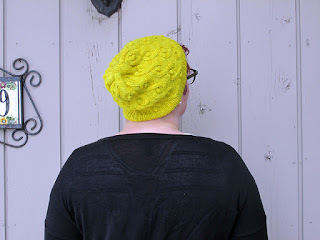 My Easy A is in a good place right now- I have about three inches left on the back, then the icord collar and sleeves. The nature of Q2Q means I'll almost definitely be able to finish the back tonight. 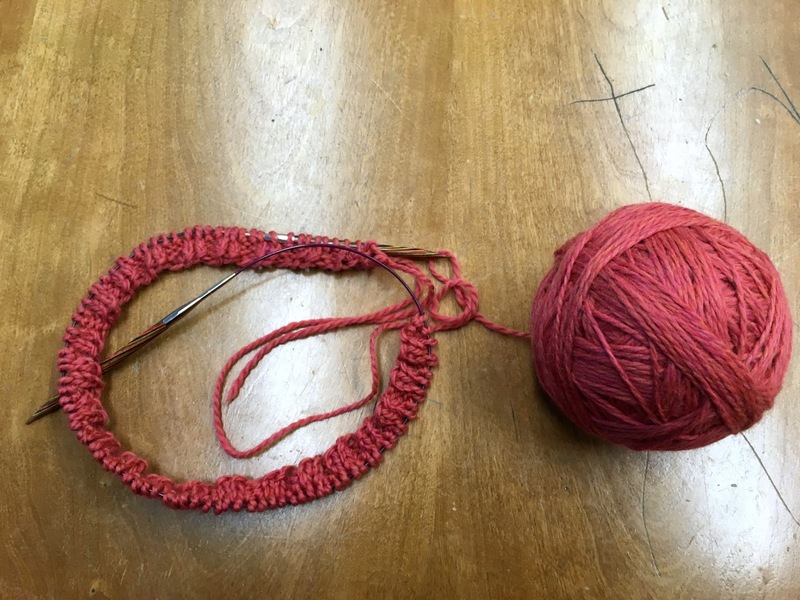 Once the body is finished, I'll have to do a little yardage math to figure out if my plan for the sleeves will work, so I'll need to remember to bring a backup project to rehearsal tonight as well. Mystic, my snuggle bum, my faithful knitting companion, is currently in the animal hospital with pancreatitis. He's started showing some signs of improvement, and we should be able to bring him home this weekend, but we were definitely not expecting this. To help with his vet bills, all my patterns and collections are 25% off with the code "Mystic" through the rest of February. Well, that right there is about 40% of the back of my Easy A and I'm pretty pleased with myself. Play rehearsals have ramped up this week, and we're running the show pretty much every night. It's hard to believe that next week is tech and production, but here we are! When I haven't been at work or at play rehearsal, I've been reading Quackery: A Brief History of the Worst Ways to Cure Everything, and it's absolutely delightful. I love medical history, and this book is really entertaining, and it's been just the thing to give me a break from the play. 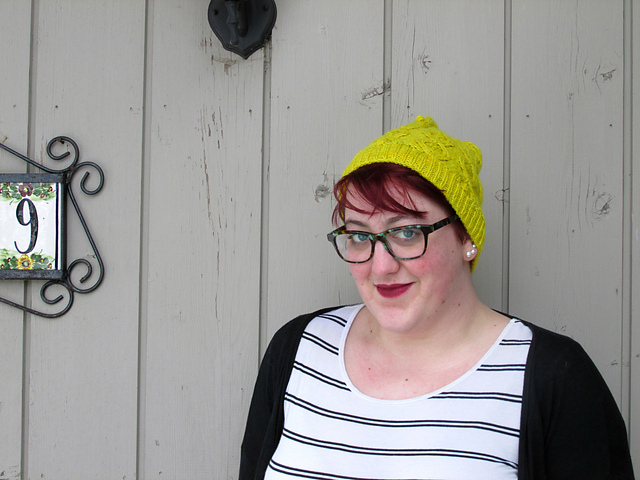 I've had the idea for this hat floating around in my head for ages, and I'm so happy to finally be wearing it around! 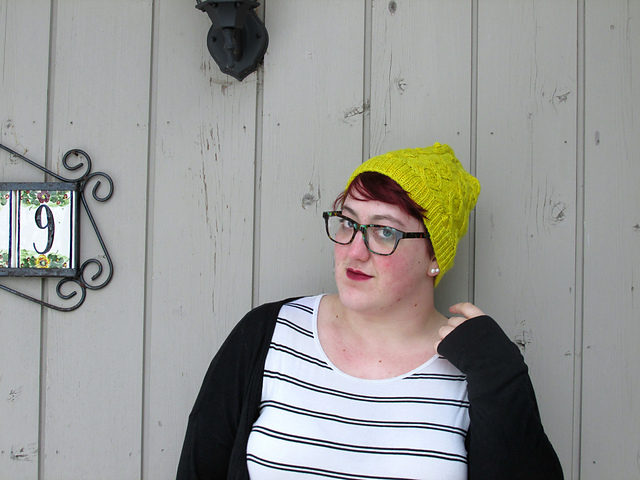 Pilstam is a slouchy beanie featuring a fun bobbled cable pattern. 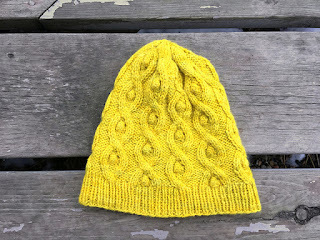 Knit in a bright color, this is a fun, standout knit, or it can be knit in a more subtle tone for a classic winter look. Cable pattern has both charts and written instructions. Pilstam is live on Ravelry and is $1 off all week! Yes, that is exactly what that looks like. Yesterday at lunch I bound off the front of my Easy A-long sweater and I managed to cast on and get a couple back rows done before bed last night. It's a very exciting accomplishment for me, and I am very happy with this progress. I'm really looking forward to this weekend. The next two weeks are going to be crazy busy with the play ramping up, and I could definitely use a couple of quiet days before that happens. 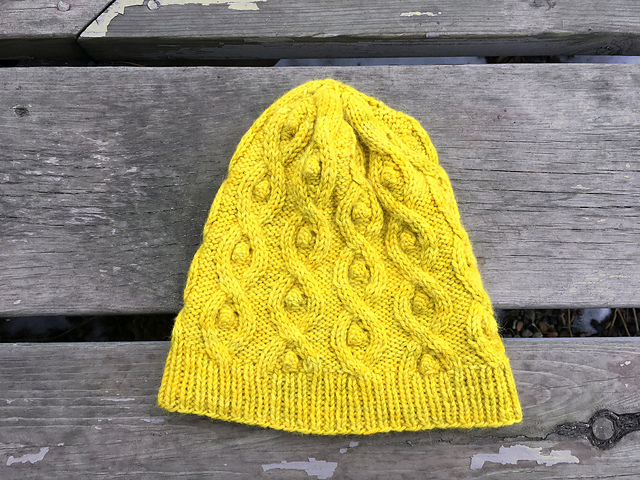 I do have one pattern that's almost ready to release, and a couple others in different stages, but I'm not going to pressure myself to get anything done this weekend. If it happens, fantastic, but if it doesn't, then I clearly will have needed the recharging time.